How Do Good Health Technologies Get to Poor People in Poor Countries? Many people in developing countries lack access to health technologies, even basic ones. Why do these problems in access persist? 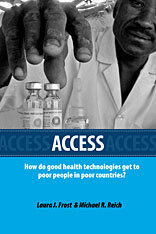 What can be done to improve access to good health technologies, especially for poor people in poor countries? This book answers those questions by developing a comprehensive analytical framework for access and examining six case studies to explain why some health technologies achieved more access than others. The technologies include praziquantel (for the treatment of schistosomiasis), hepatitis B vaccine, malaria rapid diagnostic tests, vaccine vial monitors for temperature exposure, the Norplant implant contraceptive, and female condoms. Based on research studies commissioned by the Bill & Melinda Gates Foundation to better understand the development, adoption, and uptake of health technologies in poor countries, the book concludes with specific lessons on strategies to improve access. These lessons will be of keen interest to students of health and development, public health professionals, and health technology developers—all who seek to improve access to health technologies in poor countries.